Add a New Premium Ad Position to Your Inventory in 5 Minutes. Brandboard is an advertising solution that places high definition, attention-getting ads at the top or bottom end of any page — just like the back cover — or inside cover of a magazine. Regardless of what ad serving technology you are using, you can add new, premium advertising inventory with Brandboard. If your advertisers need a bolder statement, the Curtain Call ad position delivers serious brand impact. Move your mouse away from this page to see it. When your mouse moves back in, full control returns to you. We know publishers need to offer advertisers compelling inventory, but we don’t believe that taking control away from the reader is a good strategy — that’s just plain rude — the kind of thing that reflects poorly on both the advertiser and the publisher. Check out the samples then get in touch to see how digital media can learn an important lesson from print media, and how that can increase your revenue. Regardless of what ad serving technology you are using, you can add new, non-intrusive advertising inventory with brandboard. We think that it is better to serve large ads inline, without annoying page effects, rather than hijacking the browser and turning off your audience. 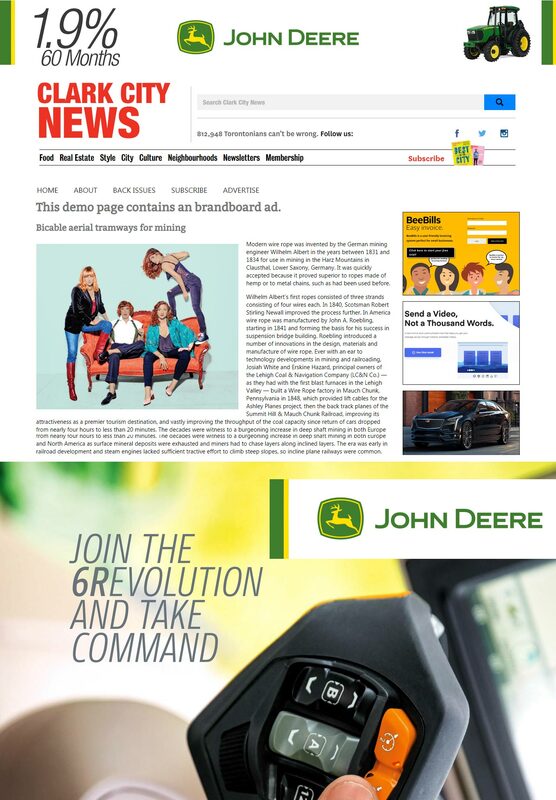 brandboard is an advertising solution that places high definition, attention-getting ads at the end (or near the end) of any page — just like the back cover of a magazine. Get in touch to see how you may be able to add $5k - $15k of revenue per month, per property, with brandboard. *Some sites will not allow this demonstration. Small changes may be required for installation depending on your site structure. Want to see it working on your site?